EP “Live in Paris” is coming March 6th ! 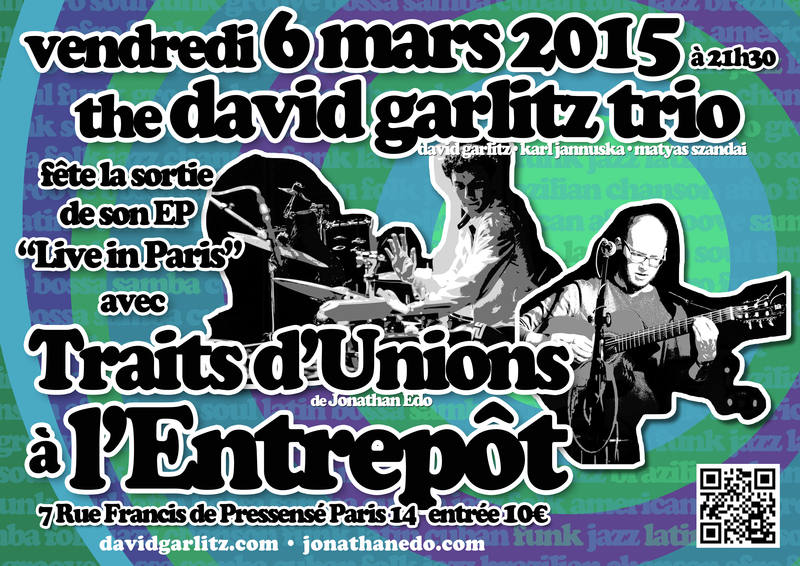 “A funky sound with Cuban and Brazilian roots, all the finesse of modern jazz, and the lyricism of the great American songwriters” – this is how Paris-based singer-songwriter David Garlitz describes the new direction taken on his next release, the David Garlitz Trio – “Live in Paris,” coming on March 6th, 2015. 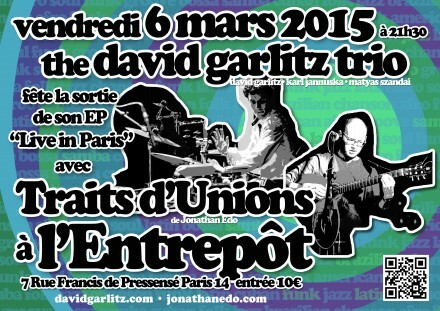 After the success of his U.S. “micro-tour” in 2013 and the release of his first LP, “A Poor Man’s Pocket,” in January of the following year, Garlitz found two new partners-in-crime on the Paris jazz scene : drummer Karl Jannuska and bassist Matyas Szandai are two of the most sought-after players in the City of Lights, having played locally, toured internationally, and recorded with the likes of Kurt Rosenwinkel, Brad Mehldau, and Dave Liebman. Garlitz, a native of Plymouth, New Hampshire, spent his early twenties in the “underground” of Philadelphia’s fringe-jazz community, before heading off to Havana, Cuba, to study Afro-cuban rhythms. Along the way, he fell in love with a charming Parisian girl and ended up in Paris, where he started writing his own songs, drawing as much inspiration from Cuban and Brazilian acts like Seu Jorge and Los Van Van as he did from his songwriting idols Paul Simon and Tom Waits.